Location of Incident just released their Rock N Roll Album “Strong Without my Fears” and are doing an album release party. 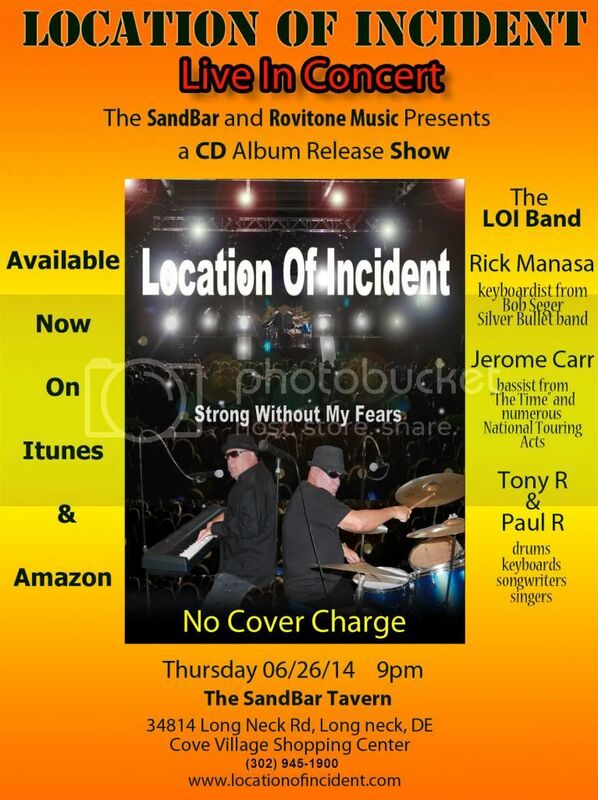 The party will take place at the SandBar Tavern in Long Neck, Delaware on June 26, 2014 at 9:00PM. Check out the flyer of the party bit.ly/LOIreleaseParty. “Strong Without My Fears” is an album full of the Classic Rock sounds we all love and R&B inspirations. The album was produced by Sammy Merendino who has worked with Hall and Oates, Billy Joel, and Michael Jackson and then recorded with renowned recording engineer Derek Lee. Lee has worked with the likes of Britney Spears, The Plain White T’s, Matchbox 20, and Bruce Springsteen. “Strong Without My Fears” is strong, straight ahead, foot tapping rock with a positive message. If you’re ready for the strong rock ‘n roll sound that is Location of Incident, check out their website at www.LocationOfIncident.com, their YouTube at: bit.ly/LOI-YOUTUBE and their Reverbnation at: bit.ly/LOI-Reverbnation. Be sure to keep rollin’ with them by staying updated with their Facebook at: bit.ly/LOI-Facebook and Twitter at: bit.ly/LOI-TWITTER. Finally, make sure to check out their album on iTunes here: bit.ly/LOI-StrongWithoutMyFears-itunes and Amazon here: bit.ly/LOI-StrongWithoutMyFears. They are currently fundraising on kickstarter.com here: kck.st/1kymnI7, for promotion, distribution and touring.